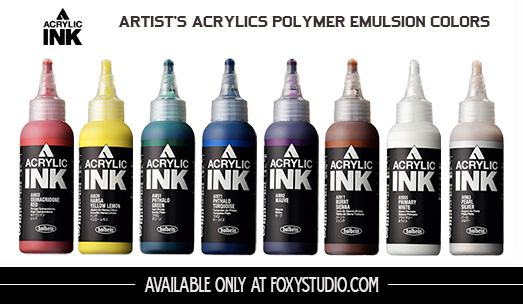 Finest Acrylic Inks, water based non toxic and very vibrant. The Newest paint line from Holbein that will replace the dismissed Aeroflash Acrylics. Can be thinned with Water or used straight out of the bottle. 100ml Bottles featuring a screw cap anticlog. Carefully selected colors that are easy to use from among strongly beautiful acrylic colors. Holbein Acrylic Inks are excellent in light fastness, once dried it becomes water resistant. Even when used with a marker container, an air brush, a pen or a brush, it can be used as it is without diluting with water. The coloration by the pigment of choice is beautiful, it is excellent in light resistance, and it becomes a water resistant coating film after drying. It has the same high pigment concentration as [Heavy body] and [Fluid] of the Holbein Acrylic series, and adopts the same color composition. These can be used in combination, and a variety of expressions can be made together with various media. 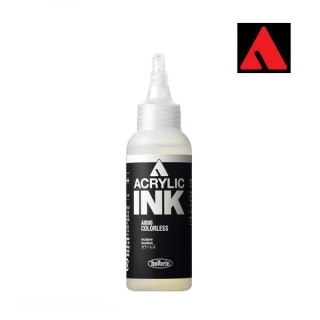 Acrylic [Ink] has 48 colors and a colorless (drawing medium) lineup. Acrylic [Ink] is a high concentration liquid acrylic paint with high pigment concentration equivalent to that of other Holbein acrylic series. Compared to the case where the acrylic paint with tube is thinned with water, it is powerfully beautiful coloring without painting. Adopting a twist cap, there is no need to remove the cap for opening and closing. It is easy to put paint in narrow container and workability is improved. Multiple expressions are possible by using inks together with other Holbein Acrylic series such as Acrylic Colors, Medium, Gesso, Modeling Paste, etc, which can be mixed between Series. SHAKE WELL BEFORE THE USE! you must hear the paint mix ball inside the bottle shaking. 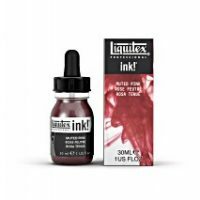 Use the Holbein Acrylic Ink CLEAR to improve their transparency and reduce the tip dry.